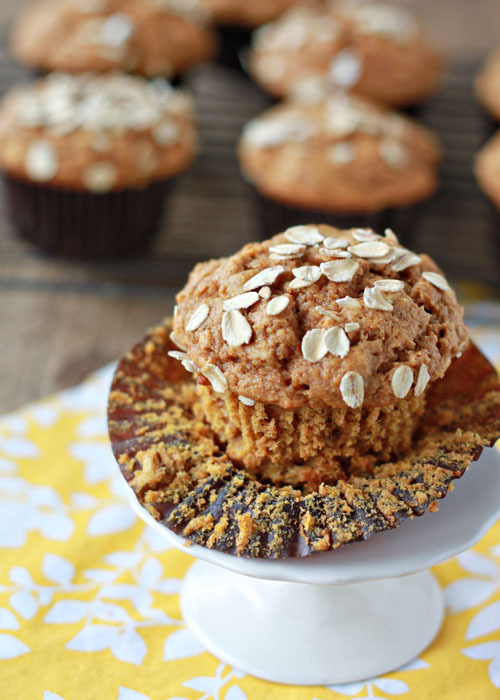 These moist, hearty whole wheat muffins make the house smell like fall. I had so much fun making these muffins with my little girl. I’ve held her on my hip as she “helped” me awkwardly sift and stir, but this time, and for the first time, I was able to sit her on the kitchen counter like a big girl. As I kept a hand on her at pretty much all times, she measured, spooned, poured, and mixed. “Eggs!” “Na-nilla!” “Flow-ah!” she exclaimed as we pulled ingredients out and mixed them in to make the perfect muffins. And, of course, we also made a perfect mess. The best part about making muffins with my gal is that she gets excited about making them, watching them bake, and, finally! Eating them! Victory when you’ve got a picky toddler. We just bought one of these, but with everything else on our plates moving into our new house, we have yet to put it together. But I think it’s pretty much the greatest kitchen invention ever. Can’t wait for my little gal to be able to assist me while I get to mix and stir with two hands. A novelty these days. Anyway, these muffins. I know it’s a smidge early to start pumpkin recipes, but I just. can’t. help myself. If I’m sick of pumpkin by October, I fully admit I’ve only myself to blame. I promise though, these muffins are worth a dive into fall recipes perhaps a bit too early. They’re hearty, moist, filling, kid-friendly, and flavored with all the wonderfully warming spices of fall – cinnamon, ginger, nutmeg, cloves. My favorite. Heat oven to 400 degrees Fahrenheit. Line 12 standard (1/3 cup) muffin cups with paper liners. In a large bowl, mix together the flour, 1 cup oats, baking powder, baking soda, salt, cinnamon, ginger, cloves, and nutmeg. In a medium bowl, whisk together the buttermilk, pumpkin, granulated sugar, brown sugar, oil, egg, and vanilla. Add the wet ingredients to the dry ingredients, whisking just until the ingredients are incorporated. Divide batter between the 12 muffins cups. 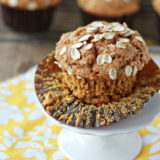 Divide 2 tablespoons oats between the 12 muffins, sprinkling a few evenly over each. Bake for about 15 minutes, until the top of the muffins spring back when poked and a toothpick inserted into the center of one of the muffins comes out clean. If you have pumpkin pie spice mix, you can substitute 2 teaspoons for the cinnamon, ginger, nutmeg, and cloves. * Create a buttermilk substitute by stirring one tablespoon of white vinegar or lemon juice into 1 cup of milk and letting it sit for 10 minutes before using. It’s never too early for pumpkin recipes in my book! I love pumpkin in any way shape or form. These would be perfect for a weekend treat!! Will definitely try them! Great recipe to get the fam in the mood for fall! Also, I appreciate the buttermilk substitute suggestion- I don’t often have buttermilk in the fridge! I think I’m ready for fall now. 🙂 I was resistant for a while, but now when I see pumpkin recipes, I feel like, “YES! THIS! NOW!” Can you send some of these over for breakfast tomorrow? Oooooo! I cannot wait to make these! Love that they are made with whole wheat flour and oats. And all of those yummy fall spices! It’s never too early for a pumpkin recipe. I can’t wait to try these. They look delicious! Love this lightened up version! And how fun to bake with your little one! She sounds adorable. I followed this recipe to the letter except for using coconut milk instead of buttermilk & a bit of molasses & a bit less white sugar. Very tasty & perfect for fall! Thanks. Made them this morning- house smells warm and inviting. I can’t wait for my kids to wake up and savor them. Thanks for the recipe- glad I tried it and so delicious! Will be a favorite for fall. Made these with mini choc chips and they were instantly devoured. Also made a version with fresh cranberries (halved or chopped) and walnuts. It’s a great base muffin to experiment with. I soak old fashioned oats in the buttermilk before adding to the wet ingredients. Loved these muffins. Substituted flour for Quinoe flour and a bit of almond flour; used new sugar substitute I found at bulk barn; it all worked great! Thanks!!! If I wanted to make these as mini muffins (for a school function), how long would I bake them and at what temp? OMG!!! These are delicious! i added blended raisins, did not use brown sugar, and used Stevia instead of Granulated sugar, 3 teaspoons of baking powder still came out AMAZING! thank you so much for sharing! Just made these — they came out delicious! Just made these – quite possibly the best muffin I’ve ever made, and I’ve made a lot!! We love muffins and I try to always have a fresh batch for a week’s worth of breakfasts. Thanks for the fantastic recipe. 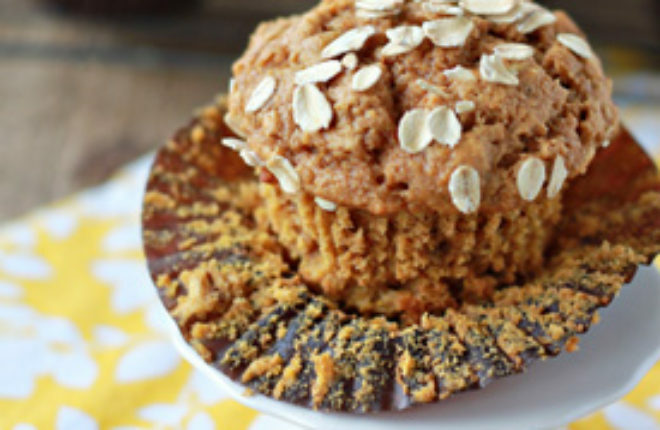 I make a lot of pumpkin muffins and even make up my own recipe sometimes, but these are the best. Excellent. I added dark chocolate chips and that was the only modification I made. These are hands down the BEST muffins I’ve ever had. Better than any I’ve had in a pastry shop. They freeze beautifully, too. I just had one that has been in the freezer for a month and it was still perfect. I have few baked goods recipes in my “box” that are 5 stars, but this one does! I have to force myself to have just one with my coffee in the a.m. Thanks! Yay, I’m so glad you like them! Thanks so much for the sweet comment. I “veganized” this recipe and was really happy with the results! I replaced the buttermilk with one cup of Almond milk, plus one tablespoon lemon juice (allow to sit for 10 minutes before using) and the egg with one tablespoon ground flaxseed, plus three tablespoons water (beaten with an electric hand mixer until creamy, about 2 minutes). I also cut the amount of granulated sugar in half. The muffins turned out moist and flavorful and perfectly sweetened. At around 170 calories per muffin, they are a perfect way to satisfy my sweet tooth, healthfully. I just wanted to add: Thanks for the great recipe! My kids are devouring these muffins like nobody’s business. I also forgot to mention that I used butternut squash (roasted and pureed at home) in place of the pumpkin puree and old-fashioned oats instead of the quick-cooking. And, as I mentioned, the results were fabulous! I will most certainly be making these again! Thanks once more! Finally a healthier muffin I actually like! Instead of the pumpkin puree I used 1 cup of frozen wild blueberries and about 4-6 oz of unsweetened applesauce. They turned out awesome! This will definitely be my go to muffin recipe. I love this recipe!! I used coconut oil instead of veg oil, and added some craisins. My kids went nuts! Plus they dome so beautifully! Just made these and they turned out great! I added some chocolate chips to give it a kick. They’re really good! These were so amazing smelling while baking! I sent some with my toddler to his dayhome for sharing day and they were a huge hit with the other little ones, even the fussy ones! I just made these, they are heavy and moist and delicious! 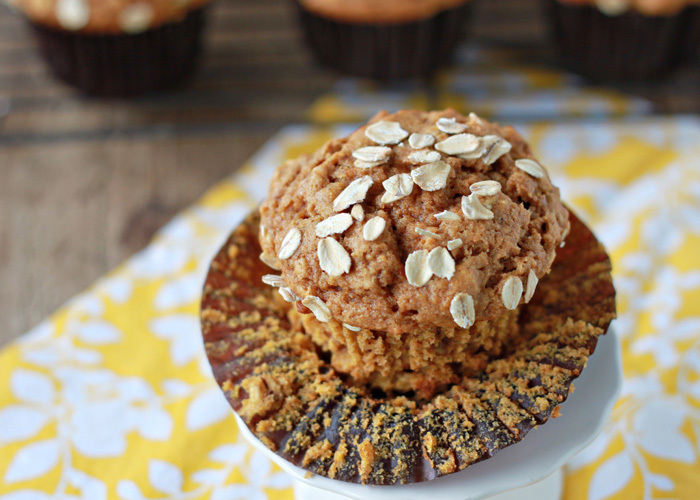 My boys need all the healthy food they can get in their skinny little bodies, and these are the best whole wheat muffins we have made so far. I cooked mine in silicone muffin cups, so I cooked them for 14 minuts. Hubby says they need another minute or two but I think they’re perfect. Thanks!! I made a couple changes to the recipe as well ! Instead of doing all the sugar, I only used half a cup of brown sugar and mashed up a overly ripe banana to substitute for the white sugar. Also, when filling the liners I only went up half way, the took a spoonful of pumpkin purée, put it on top then put the rest of the batter in that. I only baked it for 13 min as well. The recipe I made came out to be 18 muffins. I also doubled most of the spices. Came out wonderful- and ate them warm with a little bit of melted butter. Loved this recipe as a base for my changes !